The Palazzo, Travisso’s premier amenity center offers residents the opportunity to stay fit all year round. This year, The Palazzo received top honors as the Best Community Club House in the state by the Texas Association of Builders. The award was announced during TAB’s Sunbelt Builders Show, an annual event that recognizes excellence in all areas of the home building industry. 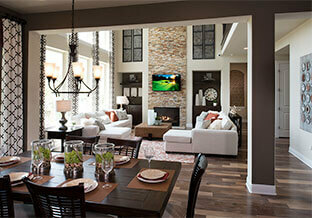 The Palazzo is a mecca of recreational space that comes with a large dose of relaxation. Designed with our residents in mind we offer the best possible opportunities to pursue a healthy and active lifestyle. We know our residents are busy and obtaining a work-life balance is sometimes a struggle. However, at Travisso finding time to relax, workout, and socialize couldn’t be more convenient. The Palazzo boasts a central Travisso location for all of our resident’s fitness, recreational, and social needs. With over 9,200 sq. ft. of outdoor and indoor recreational space, The Palazzo offers hours of endless possibilities. Outside, relax in the sunshine then refresh in the resort-style pool or splash pad. The pool area’s open air pavilion boasts a large fire pit for roasting s’mores. Shaded and unshaded deck areas complete the patio. After a quick swim enjoy a game of tennis at one of two lighted tennis courts. A playground and recreational soccer fields provide hours of fun and activities for kids. Inside, The Palazzo’s 2,000 square-foot fitness facility includes state-of-the-art workout equipment such as treadmills and elliptical machines. In addition, the facility offers weight-lifting machines, free weights, exercise classes, clinics, and yoga. Scheduling time to get in a workout couldn’t be easier. The facility opens at 5 a.m. for early morning workouts and closes in the evening at 10 p.m. The Palazzo also offers meeting room rentals for your next special occasion or celebration. Several options are available including an option complete with a kitchen area. And, meeting new friends and neighbors isn’t a problem either. Each month, our on-site community lifestyle director plans hours of events, childrens’ activities, and informational seminars for endless hours of fun, education, and entertainment. You can also fill-up your social calendar by attending a variety of get-togethers such as a ladies morning coffee, a wine social or a Friday evening happy hour. Monthly book clubs, walking clubs, football social hours, and much more are also available. In addition, outdoor activities abound including 10 miles of planned hiking and biking trails, picnic tables and benches, and a regional park. And, when was the last time you took the time to watch a bird or walk a trail? Experience and explore all Travisso has to offer. We offer unique opportunities for both your active outdoor and indoor lifestyle blended with first-class amenities. Without delay, visit us today and discover The Palazzo, unbelievable views of the Texas Hill Country, and a vibrant community alive with spirit. Come for the view, stay for the lifestyle. Travisso—your place to call home; your place to relax; your place to explore.